The tracks of a roller coaster span the width of the sole panel. A passenger car is in rightwards motion on a moderately uphill portion of the roller coaster tracks. The car is about to reach a steep vertical drop, presumably in a few seconds. In the background on the right a sign hangs from support wires. 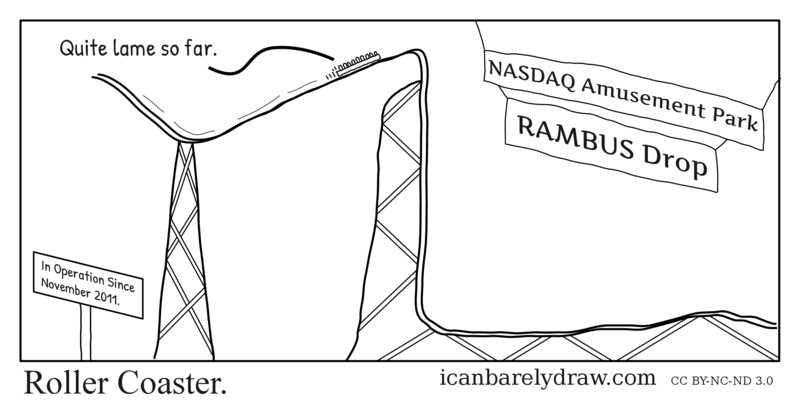 It reads: NASDAQ Amusement Park. Below it hangs another sign that reads: RAMBUS Drop. In the foreground, on the left, a sign is posted. It reads: In Operation Since November 2011. From the passenger car, a voice is heard. Voice: Quite lame so far.